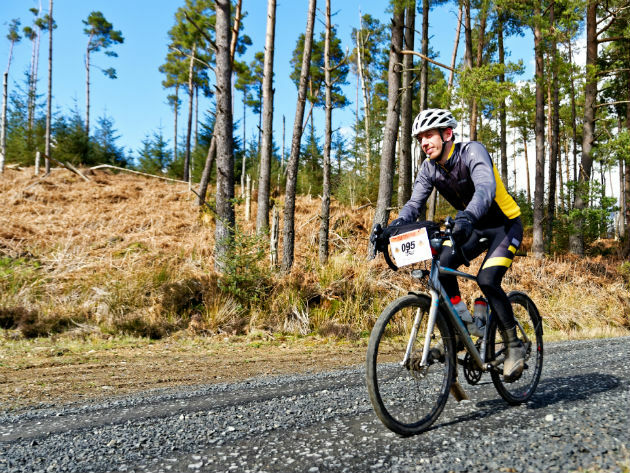 Last Saturday I rode the fantastic Dirty Reiver “gravel grinder” through Kielder forest. I hadn’t spent more than ninety minutes on a bike since the summer before, so it was tough – a 200km course with almost 3500m of ascent, an endless procession of winching climbs and screaming descents with your tyres rattling over hard packed forestry roads. The course was super neat, with only a couple of short links on tarmac and three slightly rugged rocky sections (think easy mountain biking more than “driving my 7.5 tonner through the forest”) to join up massive sections of forest road. There was even a ford, which finally put paid to my hopes of keeping my feet dry! My commuter largely held together except for an unfortunate flat on the (tubeless) rear early on. It would have been nice if someone had told me I’d left my hub dynamo switched on before the first feed stop though… doh! The feed stations were excellent and all the marshals were unrealistically happy and enthusiastic about standing around the middle of nowhere as four seasons of weather blew over. After a bruising 175km we hit the shores of Kielder reservoir for a fantastic hour of zooming and tricky cornering on manicured dirt – it felt like velodrome boards in comparison to what had come before! I got back to the finish line at Kielder castle with nothing much left in the tank, to find free beer and warming soup on tap. It’s hard to believe the first major UK gravel event went so smoothly, massive congratulations to the team who put it all together. May there be many more events like this! What bike/wheels did you run for this? Would you make any adjustments to it if you were to do it again? I was on a Planet X London Road. It has 650b wheels (Hope Pro2 / Stan’s Crest) with Compass Babyshoe Pass tyres, which are a little over 40mm. Awesome, thanks for getting back to me. I love the idea of 650b wheels and fatter gravel tyres, seems to be the consensus to use bigger tyres with little tread, and the 650b wheel is a great solution. What else do you use the 650b wheels for, are they permanently on the bike, or was that a one off for this event? Think I need to have a chat with my local wheel builder about some options here. Initially I was just thinking of 700c wheel, approx 38mm tyre run tubeless but the 650b is a pretty cool idea. It’s just how I have the bike set up for commuting. It’s a 700c frame but the wheel circumference on 650×42 is almost identical so it handles fine. I’m considering 650b wheels for my London Road too. What’s the maximum width tyre you think the frame can take?